According to an article in the MetroWest Daily News, two men were arrested in Framingham following a traffic stop earlier this week. The article states that the police pulled a vehicle over on Concord Street due to a broken taillight. The driver of the vehicle reportedly got out of the car and attempted to run away but was ultimately stopped by an officer. The passenger remained in the vehicle. During the stop, the officers allegedly saw the passenger rummaging through a duffel bag at his feet. The officers believed that the passenger was possibly trying to conceal a weapon, so they ordered him out of the car and searched him, as well as the duffel. The police recovered bath salts and eight bags of marijuana in the duffel, as well as a bag of marijuana in the passenger’s pocket. There is no indication that the total weight of the marijuana exceeded an ounce. The passenger admitted that the bag was his and the police charged him with possession with intent to distribute marijuana subsequent offense under G. L. c. 94C, § 32C and illegal possession of bath salts under G. L. c. 94C, § 32B. During the course of the stop, the police also determined that the driver’s license was suspended and arrested him for driving with a suspended license subsequent offense under G. L. c. 90, § 23. The police also cited him for the broken taillight. While the driver may have a hard time defending the charge issued against him, the passenger does appear to at least have a potential defense to the possession with intent to distribute charge. To prove that the passenger is guilty of this charge, the Commonwealth would have to show the following beyond a reasonable doubt: (1) that the substance was in fact marijuana; (2) that the passenger possessed some perceptible amount of it with the intent to distribute it to another person; and (3) that he did so knowingly and intentionally. As to the second element, the jury is entitled to consider a number of different factors, including the quantity of the drugs in the passenger’s possession, the street value of the drugs, the passenger’s financial resources, how the drugs were packaged, whether other items were found along with the drugs which might suggest drug sales, such as packaging materials, scales, or large amounts of cash, whether there was any evidence suggesting that a sale was in progress, whether there was any evidence that the drugs were part of a larger stash, and/or whether there was any evidence that the passenger repeatedly traveled at short intervals to known drug centers. The passenger can argue that the marijuana was in his possession for personal use, which is a civil offense, and that he therefore did not have the intent to distribute it. Although the marijuana was in different bags, that is literally the only factor that the Commonwealth has to argue that this marijuana was going to be distributed. There was not an overwhelming quantity of marijuana, there is no indication that the street value of the drugs was particularly high, and there were no packing materials found with the marijuana – no other bags, no scales, etc. Additionally, there is no indication that the passenger had any amount of cash on his person and the police made absolutely no observations of the passenger that would indicate that he was involved in the sale of the marijuana – they did not observe him engage in any transactions with any individuals, or engage in any other sort of conduct that would suggest a sale or an intent to sell. The passenger’s attorney can certainly argue that the passenger simply purchased in bulk – after all, if marijuana is sold packaged in bags, it is certainly bought that way as well. 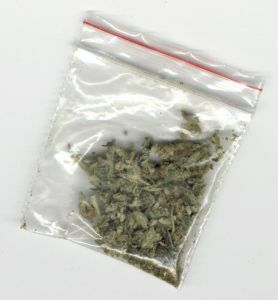 Given the fact that there is no indication that the amount of marijuana found in the bags was more than an individual could or would use himself, the passenger appears to have a strong argument that the Commonwealth cannot meet the second element of the offense. Even though there do appear to be many facts in the passenger’s favor, he did make a statement to the police acknowledging that the bag was his, and there were also bath salts in the bag, which are illegal to possess. In light of the fact that the passenger may have a strong defense to one charge, but a weaker defense to the other, he will need an attorney who can help him determine the best course of action and get the best possible result in his case. If you or a loved one is in a similar situation where you have a strong defense to one charge, but a weaker defense to another, you will also need an attorney to help guide you through the process and make sure that you get the most favorable outcome possible. Attorney Daniel Cappetta has been practicing criminal defense for many years and knows how to successfully navigate the criminal justice system. Call him for a free consultation today.